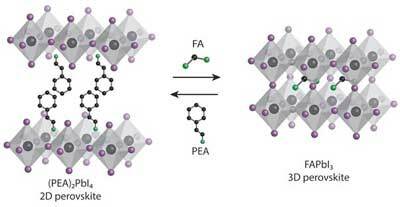 (Nanowerk News) Formamidinium lead iodide is a very good material for photovoltaic cells, but getting the correct and stable crystal structure is a challenge. The techniques developed so far have produced rather poor results. However, University of Groningen scientists, led by Professor of Photophysics and Optoelectronics Maria Antonietta Loi, have now cracked it - using a blade and a dipping solution. The results were published in the journal Nanoscale ("Scalable fabrication of high-quality crystalline and stable FAPbI3 thin films by combining doctor-blade coating and the cation exchange reaction").